Holiday Inn. Box 9864, Jackson, Mississippi. Phone Number EMerson 6-9411, Teletype JN 165, On New Freeway, Highway 51 North, Jackson. Completely Air-conditioned and Steam Heated. All 102 Rooms have Telephones, TV, Dressing Rooms, Glass Doored Tub-showers in Luxury Baths. “Restaurant of Distinction.” Holiday Inn, Your Host from Coast-to-Coast. Any idea exactly where on Hwy 51 (State Street?) this was located? Well, I don’t know that it is the State Street section of Hwy 51. The section of I-55 North that is north of Riverside and on up was there at least by the mid-1950s. Maywood Mart, Lefleur’s Restaurant (where Lefleur’s Gallery is now), Deville Plaza were all part of this early phase of development. The fact that the postcard says “Freeway” makes me think that’s the section it was on. I wasn’t around Jackson in this period, so hopefully someone who was can come in here and answer this more particularly. If not, when I’m back in Jackson next week, I’ll try to swing by the library and check out the city directory to try to place this better. Is it possible this was an earlier Holiday Inn at the site of the multi-story concrete Holiday Inn across from Bailey Jr. High School? Also, does anyone have pics of The Jacksonian Inn or ehatever the name was where LaFleur’s was located in North Jackson? This 1950s Holiday Inn seems much more sprawling than the site where that hotel is now across from Bailey. I still think it must have been on the part of Hwy 51 that’s now subsumed into I-55. As for the Jacksonian, I have recently acquired some pretty cool postcards showing bits and pieces of that motel, and I may be taking next week off–if so, I’ll send back some Jacksonian postcards just for you! I’m fairly sure that this was the predecessor to the current hotel on I-55 North. It was replaced in stages, with the one storied sections giving way to two storied buildings with the final addition of a six storied tower in front- the one we see today. I’m doubtful if anything of the original survives. If memory serves, the hotel might be a Clarion now. Anybody have any idea, when this became the site of the Clarion? This hotel was on I-55. When my family moved to Jackson from Laurel in 1967, this is where we stayed waiting for our home to be completed. It was across the highway but close to DeVille. At the time, there was a BBQ house (Ossie’s), Liberty DeVille grocery store and the Briarwood Swim Club (on Reddoch Road), if that helps anyone place it. I sure miss my Jackson-thanks to all of you who post…! Where was Liberty Grocery located at in DeVille? Yes the Holiday Inn in the postcard is now the Clarion on 55. 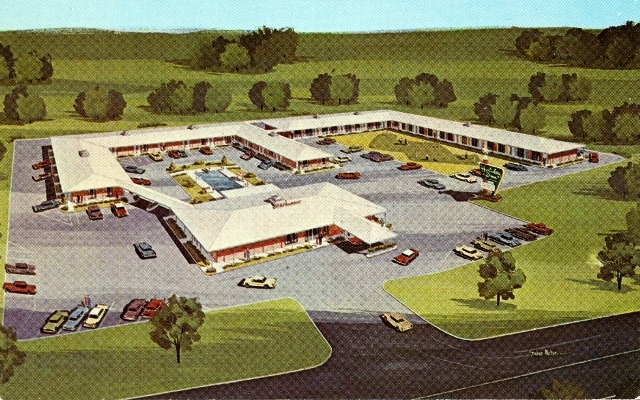 Looking from I-55, the Liberty DeVille was on the left end of the building with the scalloped sidewalk cover. Just to the left of that building and set back, was the DeVille Cinema.